Smart home technology has opened a whole new world to homeowners. Everyday home appliances now connect to the internet and each other, giving these devices new capabilities and giving us more control. High-tech home additions once cost hundreds or thousands of dollars (plus installation), but you can now hook them up yourself and pay far less to do it. With internet-connected devices, you can keep an eye on your home and control it remotely using your smartphone. Advanced software and other technology in smart home devices give us much more control over and knowledge about our homes than ever before. 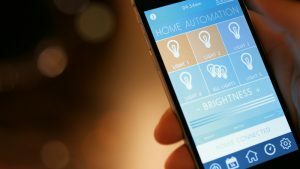 From home security to turning on the lights, you can tackle many DIY tech projects to make your home a smarter, safer, and more convenient place to live. Smart systems from companies like Simplisafe, Ring, and Nest are wireless, interconnected systems that communicate to a central hub in your home connected to the internet. Control the system through your smartphone and arm, disarm, and manage your devices through the app whether you’re at home or away. When the device senses unauthorized activity, it will activate the siren in the hub and send an alert to your phone. You can also add a layer of professional monitoring, which typically ranges from $10 to $30 per month. Most of the top-rated home security systems also work with a variety of Wi-Fi-connected cameras, so adding audio and video recording to your setup is as easy as plugging in a camera. Simple, connected security that puts you in control doesn’t have to cost a fortune. 1. Replace your existing light switches (this will involve some DIY electrical work. If you are new to this kind of project, hire an expert to assist you. Otherwise, be sure to turn your power off at the breaker first). 3. The switches will automatically configure each bulb, allowing you to control it remotely using an app on your phone. Once you connect your lights to the system, you can create personalized lighting scenes using the app. If you’re not ready to commit to a new system, start by adding a few smart bulbs to your home. You can experiment with lighting scenes and explore smart lighting basics. Landscaping might be the average homeowner’s most unpleasant chore. Fortunately, automating your lawn care will let you take control of your garden without ever getting out the hose. If you have a sprinkler system installed already, a smart sprinkler controller is a surprisingly simple addition. Once you input a few details about your property into the app, your smart sprinkler controller will water each area the perfect amount. 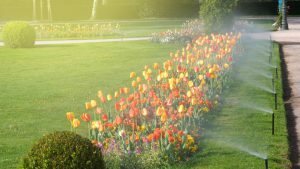 Smart controllers like the Rachio, Orbit B-Hyve, and RainMachine have a wide array of capabilities that let you dig down into the nitty-gritty of lawn care and flower bed management. On the other hand, you can also set it and forget it, knowing your greenery is in good hands. 1. Replace your existing irrigation clock with a smart one with some simple wiring and mount it on a wall. Hiring an expert to do this for you is also an option, if electrical isn’t your forte. 2. Connect the controller to your Wi-Fi. These connected devices pull weather data from the internet so they’ll know not to water your lawn if a big rainstorm is coming. This is more efficient than a rain gauge, which can only stop watering once the ground is already wet. Smart controllers use a science called evapotranspiration, which helps them understand your soil’s moisture content and determine when and where to water. These devices won’t just save you money on your landscaping bill; they may also save you money on your water bill. 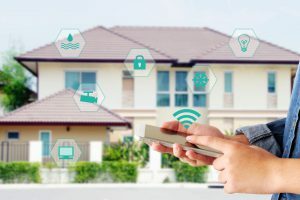 Smarter home tech offers many new ways for the handy homeowner to take control of their property, so make sure you’re putting the power of technology to good use in your house. Robert Kociecki is a real estate industry expert who serves as the Senior Vice President of Property Management and Renovation at Altisource. Altisource and its affiliates provide real estate services for consumers and investors. Visit Owners.com, where home buying and selling is made simple.